Thomas Kinton, a fur trader for whom Kinton's Knob was named, came from Virginia. He built a log tavern along what is now route 30, just north of the railroad crossing, south of Forks Inn. The building was partly torn down in 1968. 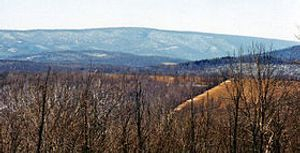 Kinton’s Knob is the name of the northwestern-most point of Will’s Mountain. This is the mountain that the Historical Society overlooks and was used as a fire lookout. The Hall at Kinton's Knob is a very unique and affordable venue. We will strive to make your meeting or event as memorable as possible.